I think it's attraction. They are both very aware of each other and attracted. I think that Edward is probably very well read, having come from a time where that was a major form of entertainment and enlightenment and also having a lot of time--eternity--on his hands. I think that he is trying to get into Bella's head via the discussion of the books she likes. One can get insight into another person by their choice of reading material. It can be revealing and, sometimes, surprising. Bella is an older soul with, perhaps, tastes somewhat in common with Edward. Austen, Bronte, Shakespeare, perhaps Dickens, Steinbeck--classic, maybe towards the romantic. It's one of my favorite scenes actually. I think that, for Edward, twilight is a reminder of how his life is not human. Humans are freer during the day, to interact, go wherever they want. He's freer at night, but he is alone--everyone else in his family has someone to spend that time with, but not him. That's a lot of time alone. Humans sleep and dream at night--it marks the end of the day. Edward cannot sleep and night is just an extension of the day--it's endless. I love how Bella tells him that she likes the night and reminds him that without the night one cannot see the stars, not that anyone sees the stars much in Forks. 1) A deep connection that binds these two, always. Also, the deep attraction they feel for each other. I always felt that maybe this was some kind of "imprinting" vampire/human style. 2) Edward is a reader. Scholarly - what with his two degrees he has a passion for learning and loves to read. Another connection for these two. 3)Jane Austin, Shakespeare, Tennyson, maybe Keats - who knows. 4) Melancholy. It almost resonates from Edward to the reader. I think it has something to do w/ attraction, but then again I think it has something to do w/ him bein a vampire. I am torn between these too. Well since he doesn't sleep, over the many many years he has probably read alot. The Jane austen, Pride and Prejudice, and stuff similar to Moby Vulgar Language Is Ugly, Romeo and Juliet, Wuthering Heights. It was sad. Another one of the moments you want to embrace Edward. Then it sums up the title as well for many. Bella and Edward now know how they feel about eachother, so I think they are just more aware of how close they are to eachother. It's almost like a teaser, how long would the current go on before someone made the first move. 2. During all the questions, we learn that the thing Edward asks the most about the books Bella has read. Why do you think he mostly asks about books? Books show how educated a person is, and what kind of person they might be. Books would give him a good look into Bella herself. She would mention the classic books we see her read. She would mention her books by Jane Austen, and she'd mention Wuthering Heights, and probably some Shakespeare. At first, I thought Edward meant that it was safest for him and Bella to be together. But now, it seems that for vampire's Twilight is safest because they would blend in best. On a nice day, the sun is at a point where it would be easiest for vampire's to walk around and blend in best. LOL Could be static but I think it was just their bodies giving of some kind of physical awareness thing. Have no clue how to explain it though. Books are ways to learn and escape. I read a lot myself so it is hard to explain. Plus he may like to read as well so he was probably interested in what she likes. Jane Austen books and Shakespeare for sure. That is my favorite time of day lol. I had no reaction though. I jus took it as something that belonged that way. Some kind of magnetic attraction toward one another. Books are timeless. And obviously he's seen she likes to read rather than watch TV. I don't really know. The chemistry between them? You can tell a lot about a person from the type of books they read. For example people who read fantasies often like excitement and want to find adventure and people who read romance are usually romantic and want to escape everyday life. Classic books. Like Wuthering Heights and Jane Austen. I thought it showed that being a vampire isn't as fantastic as it sounds. Edward sounds very sad when he talks about it being twilight. I think what books a person reads tells alot about a person, it shows what kind of things they enjoy hearing about. 1. Each time they are in science class, Bella describes an electric-like current passing between her and Edward. What do you think this current is? They're very much aware of each other. And they're starting to fall in love. 2. During all the questions, we learn that the thing Edward asks the most about are books Bella has read. Why do you think he mostly asks about books? Well since he doesn't sleep I would think a good way to pass time is to read. I know I would read more if I had more time. 3. What type of books do you think Bella mentions? Besides Jane Austin books I have no idea. 4. 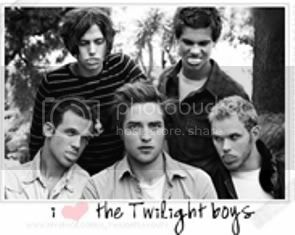 What was your reaction to hearing what twilight is like for vampires. I was actually a little confused about that line. I'm glad they have an easier time of day though. It's probably just how much they know they love each other....it's like, I want to be near this person and something is definitely pulling me towards them, but I can't have them. I think because he knows she is interested in books, and that's one of Edward's main hobbies! I thought his description was very nice prose. It seemed pretty random, so I didn't think too much of it. Just another side of Edward.